All excited and ready to carve the pumpkins. 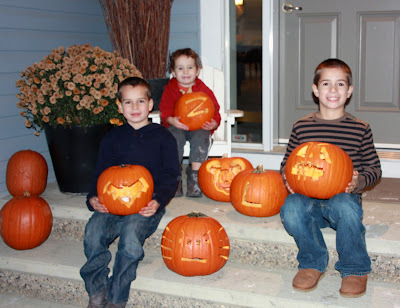 Zack did a pretty good job cleaning out his pumpkins. 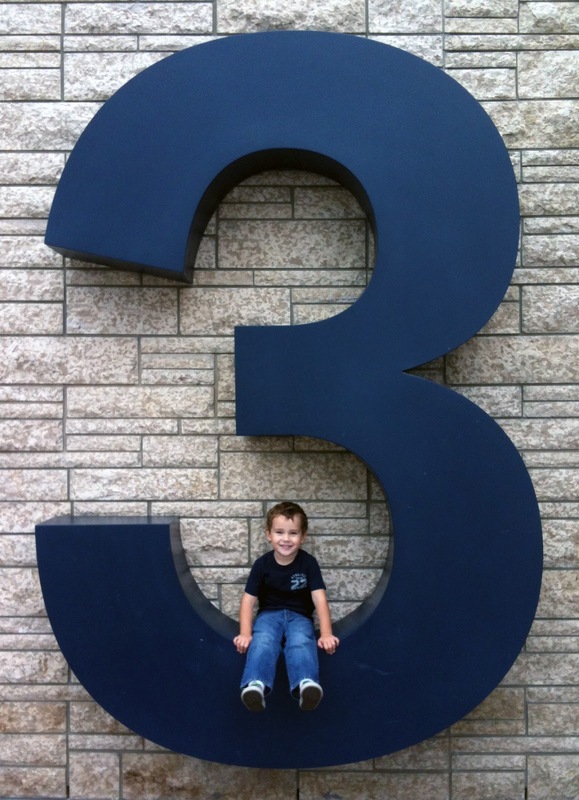 Levi's a pro at this! Zack with his "Z" pumpkin and Mickey Mouse pumpkin, both made by Michael. Jake and his spider pumpkin and jack o lantern pumpkin, made all by himself. These are the cards that the boys made this year for a school fundraiser. They colored and painted them on a large sheet of paper and then the cards were printed by a professional company. The quality is like any hallmark card. I think they both turned out so great! I'm so proud of our little artists! All my family and friends out there, if you would like to purchase a package of cards to support the boys' school please email me (anbollman@hotmail.com) and I will put in the order for you. Thanks! Today's project is this little treat bag I made for my brother for his birthday. I used a Gusseted Cellophane bag filled with one of his favorite candies. Using the Friendship Preserves stamp set I added a "Happy Birthday" to the top where the "Homemade" was. Then cut out several sizes of cardstock with the Big Shot and the Window Frames Collection Framelits and just like that I had a cute little treat to go along with his birthday card! 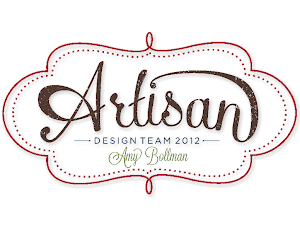 Thanks again and don't forget to join us next Friday when we do the Artisan Design Team Facebook blog hop! The first project I'm sharing with you today is a My Digital Studio scrapbook page. The Wonderfall Digital kit has so many cute papers and I wanted to use them all! This page was super easy to do and it only took me about 15 minutes once I had the layout figured out. My second project today is a birthday card. 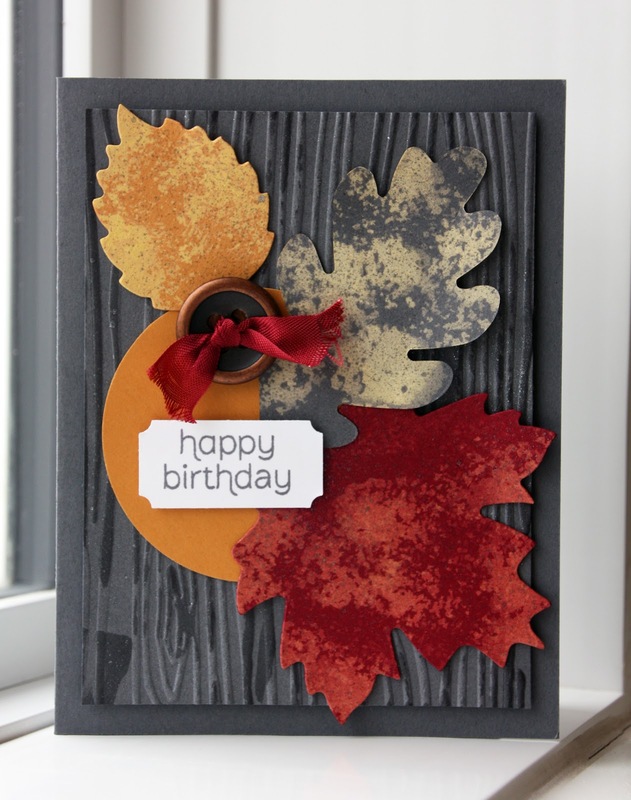 I have a lot of boys/men in my life, so I thought leaves would be perfect for a masculine card! I started with Basic Grey cardstock (its my favorite neutral), added another layer of Basic Grey that was embossed with the Woodgrain folder. I ran the ink pad across it to make the texture stand out a bit. 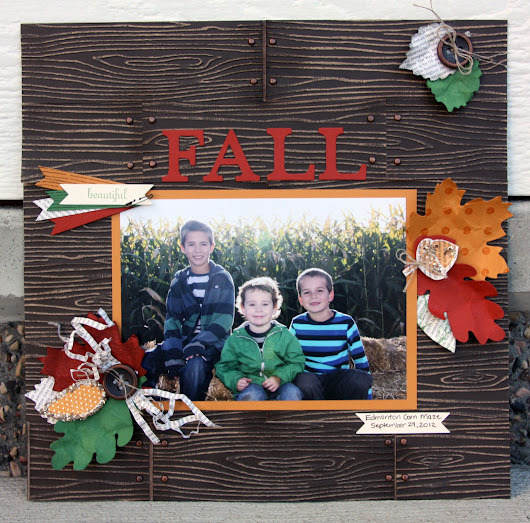 The leaves were cut out with the Autumn Accents die and then sponged with bleach to give them a natural look. I then added a Brushed Bronze Button and some Cherry Cobbler Seam Binding. It's hard to tell, but the leaves are also spritzed with the Silver Foil Smooch Spritz. Thanks again for checking out my projects for October! Be sure to stop by tomorrow for one last project. 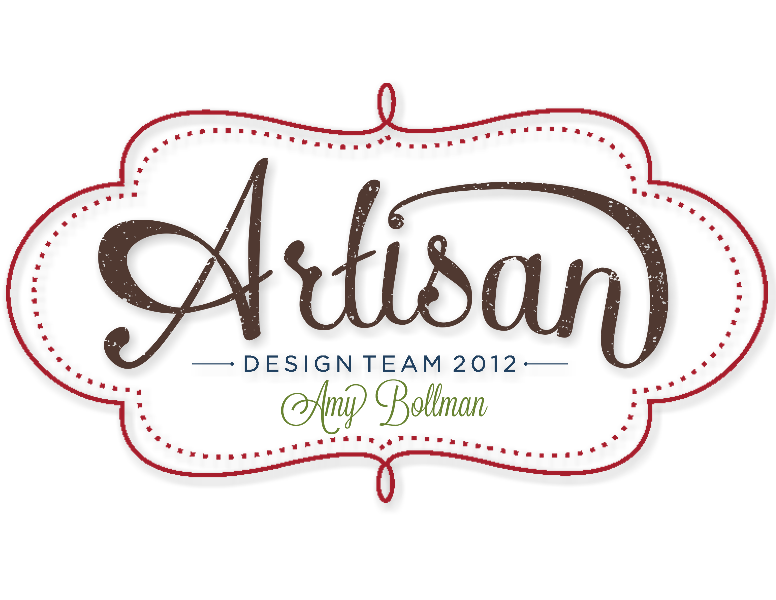 This months Artisan Design Team box had all sorts of fall goodies inside. 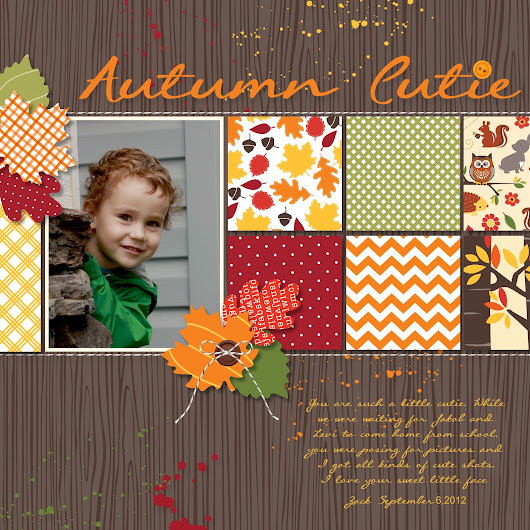 I love the new Bigz Die "Autumn Accents" and the "Woodgrain" embossing folder! This project was inspired by an old wood barn. I cut 2 inch by 6 inch strips of the Early Espresso Core'dinations card stock and embossed them with the Wood grain textured embossing folder. I then sanded the top until the lighter color came through and sponged the edges with Early Espresso to give it more depth. Each piece was "nailed" down with 2 metallic brads on each end. The leaves are all cut out with the Bigz die Autumn Accents. Each leaf has a different texture or stamp added to it. I finished off the page with a few Brushed Bronze designer buttons, linen thread and Champagne Glass Glitter. This page was quite a bit of work :) but I really love the finished look! My next project is a little pumpkin that I used as part of my fall decor this year. It was so easy to make! I spread the Multipurpose glue all over a little plastic pumpkin and then sprinkled the Champagne Glass Glitter on to it. Once it was dry I added the leaves, linen thread and "fall" tag. 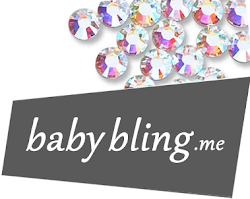 I love mixing rustic and something with a bit of bling! Thanks so much for stopping by. I'll have more for you tomorrow, so be sure to check back! It snowed a bit here yesterday and the boys thought it was the greatest thing. It's supposed to be nice this weekend and following week, so its not going to last. 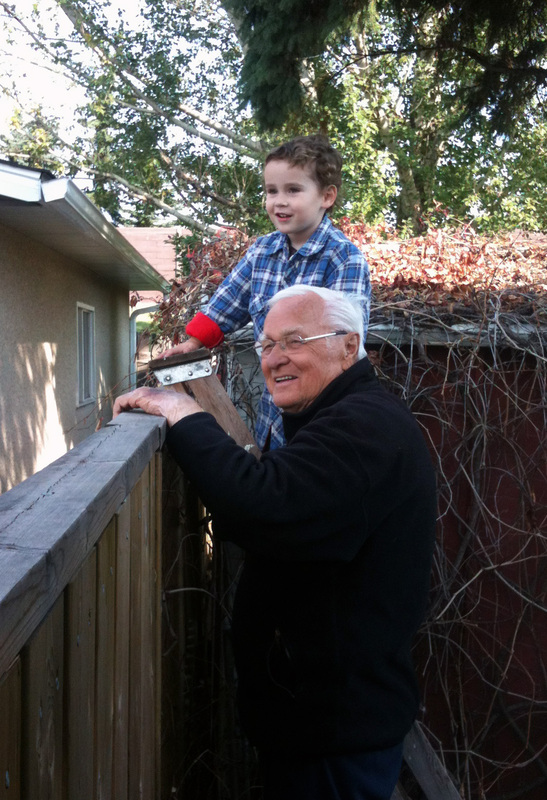 Zack could not wait to get outside and play! 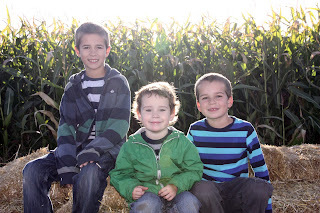 When Jake & Levi got home from school, the 3 boys went out to play. There was barely any snow to play with, but they managed to have a snowball fight! Zack collected himself a bucket of snow and the other 2 made snowballs from the snow on the deck. Below, Levi is aiming to throw a snowball at me. 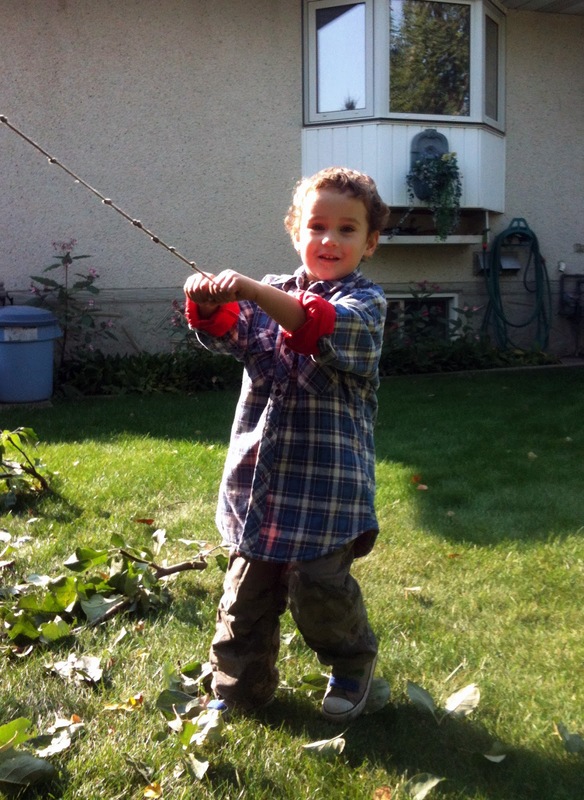 Zack helping my grandparents pick apples and trim the apple trees. 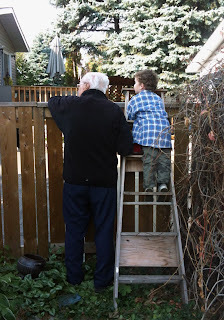 Watching the neighbours get a new driveway. Lots of concrete trucks and tools to see. Welcome to the Artisan Design Team's Blog Hop for the September Facebook projects! You should have just arrived from Wendy's blog. If not, make sure you go back and check out her adorable project. I can not wait to recreate it and make a little counting book for my youngest! 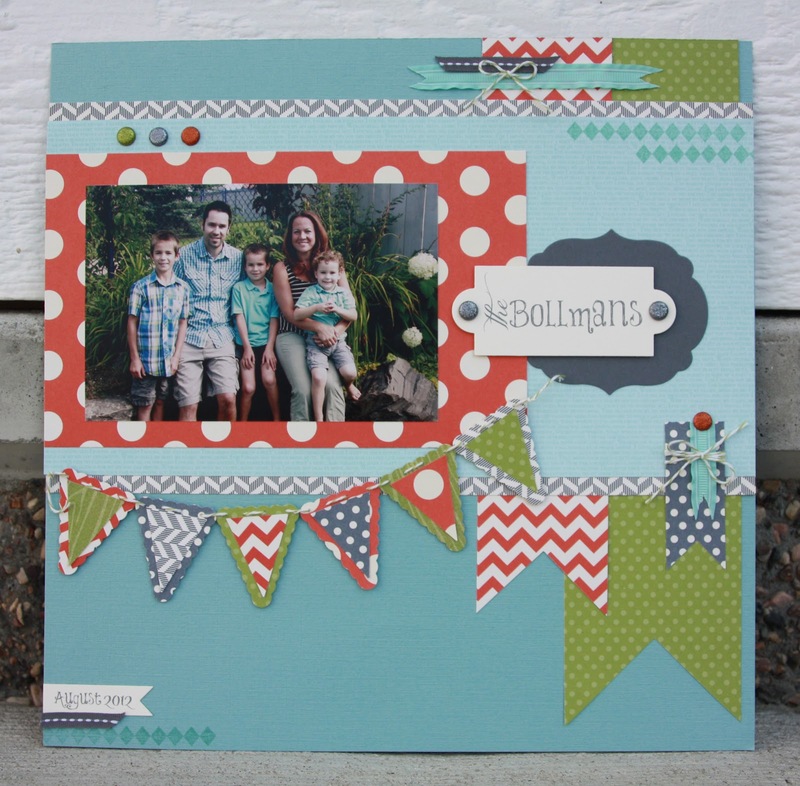 For this months Facebook project I created a family picture scrapbook page. In our box of goodies this month we received all kinds of fun paper, embellishments and stamps. My favorite was the Howlstooth & Scaringbone Designer Series paper. I love the orange chevron and the grey polka dot. Pairing it with Pool Party and Lucky Limeade gave me the colors I wanted to make this page with a summertime twist. The pennant banner was made using the Petite Pennants punch builder and I layered the papers together to create a cute bunting. I stitched them together using Bakers Twine. I added the Glimmer brads to various areas to add some round elements to an otherwise very straight design. 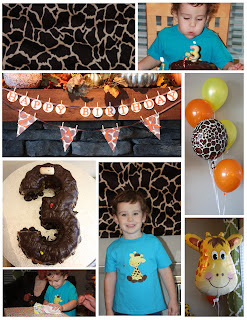 Next on the blog hop is Cindy, she created the cutest apple themed project. Go check it out!! 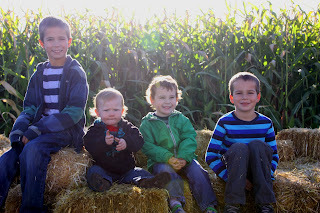 We really enjoyed going to the corn maze as a family this past Saturday. 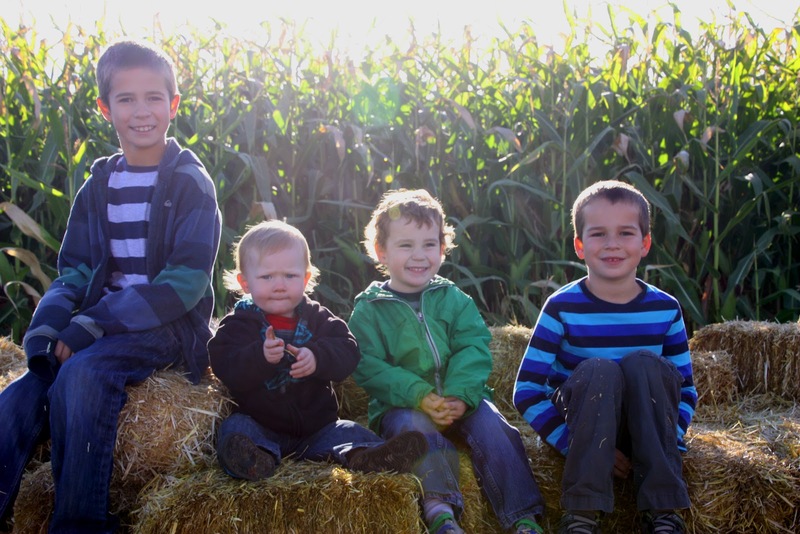 Us five, my parents, Jordan, Kristy & Alex all had a great time winding and figuring our way through the maze. This was our first time ever going to it and we will definitely be going again! 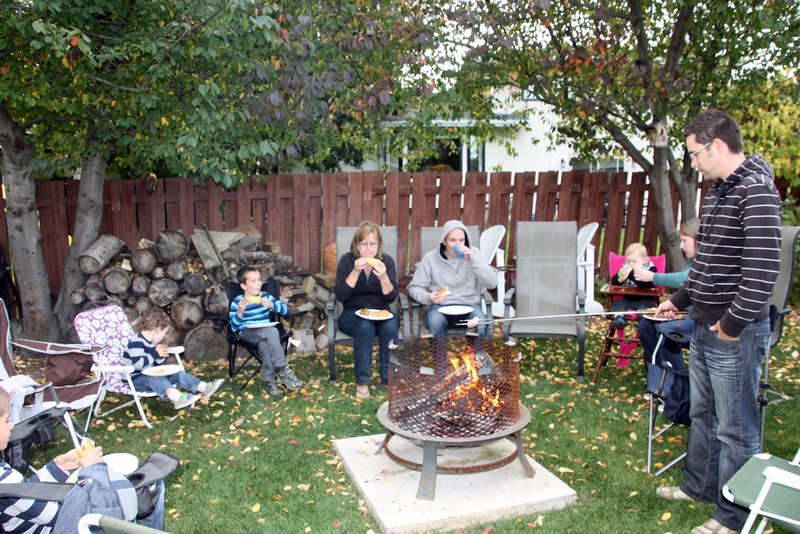 Once we were done at the corn maze, we went back to my parents place for a hot dog & marshmallow roast. We all had a fantastic day together as a family!! Zack and I went to the grocery store the other day and there was a fire truck in the parking lot. Zack was very excited and wanted to take a picture with the fire truck. The fireman came out of the truck and talked to Zack and gave him a coloring book. 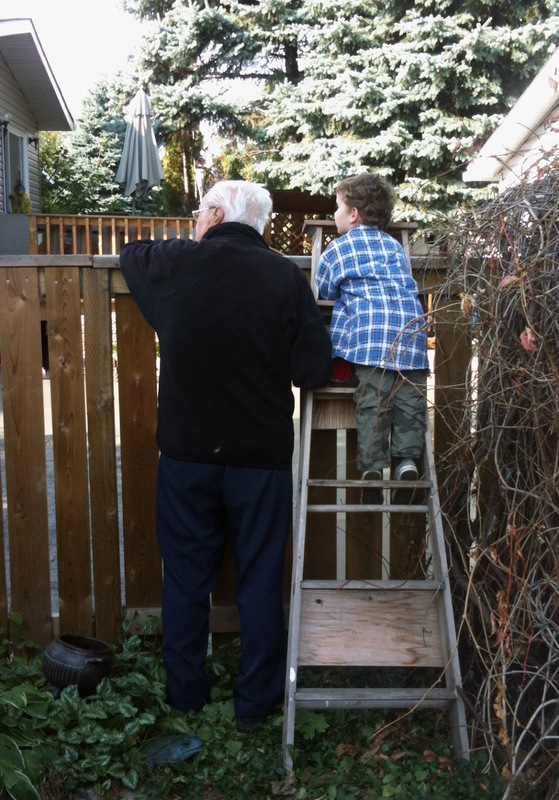 Ever since then Zack has been very excited every time we see or hear a fire truck!! Last week Michael and I went to a beautiful golf course in the River Valley with our good friends Josh & Amanda. The weather was amazing, the company was fantastic, we had a great day!!! Amanda & I golfed 9 holes and then went home to make dinner for the 4 of us. The boys stayed and played 18 holes and then met us back at the house for a Mexican dinner! Amanda & I had so much fun together!